A Cutlist is more than a list of parts – or should be. Most of the people considering using SketchList 3D want a cutlist report for their work. In Sketchlist 3D, a cutlist provides a series of functions that help you go to the shop and turn the cut list into parts. This post will show you several ways to use a cut list report most effectively. 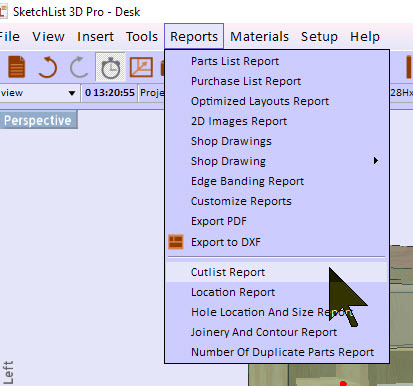 The first version of a cut list is found under the reports menu item in Sketchlist 3D. his is the simplest version of the cutlist. As you can see from this sample report, all the information you need to cut and produce your project is available in SketchList 3D. Any changes to your design, additions, deletions, or resizes, are automatically updated in this report. But how to make it more useful? Use the Parts List report. 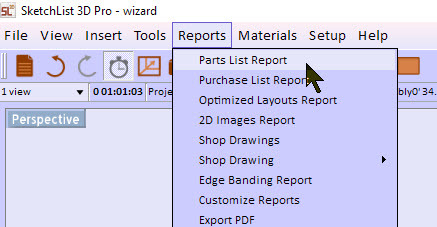 To get to the report click Reports – Parts List Report. This opens a very powerful form that allows you to specify exactly which information appears on the report, sort that in three levels, and filter information by value. 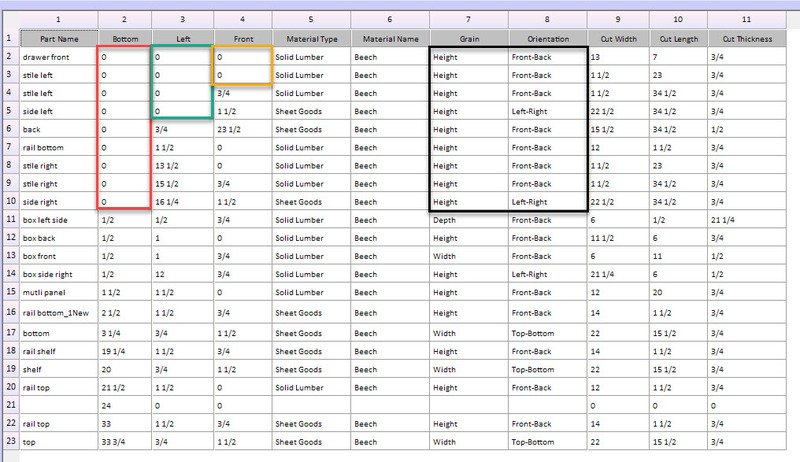 For example, select part name, material type, and dimensions. 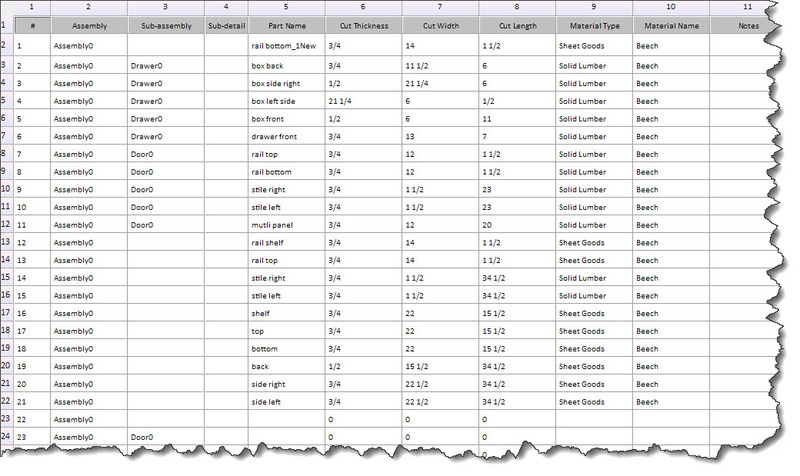 Then sort by material type and part name, then display only parts with a thickness = 1. But there is more. You can add the location information for each part – left, bottom, and front – and sort on it. To check on it, I threw in the grain direction and board orientation. If for example your side board had its thickness going from bottom to top – well that is the wrong orientation for a side board. This listing provides a good quick check on the project. Throw in a shop drawing and you are even better prepared to start cutting. 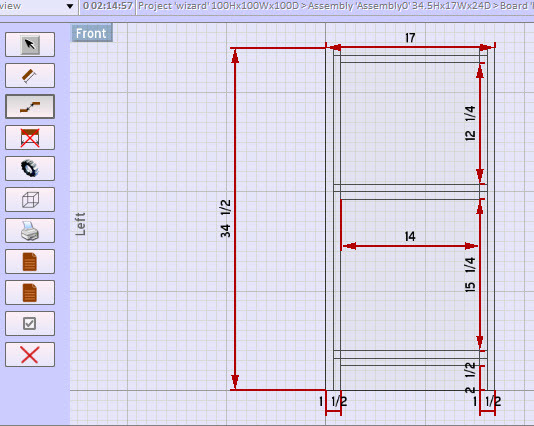 Even if you use SketchList 3D Pro and generate optimized cutting layout diagrams, this approach to cut list reports will help you check, organize, and assemble you project. If you want to see more – look at this post. To read something a bit more general about cutlists, see this post.